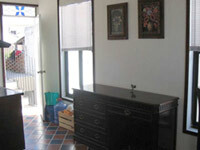 The Oldtown Condo is located in the heart of Mazatlán’s historical center. The location of the Condo allows quick access for those who want to enjoy the beach. Half a block from the ocean a 3 minutes walk takes you directly there. The apartment offers everything you need for a pleasant stay in Mazatlan because it is a loft which offers you a very special Mexican atmosphere due to its equipment but also because of its fantastic location. Everything you could possibly desire is nearby. Small grocery shops, laundries as well as tiny restaurants offering you typical dishes for Mexico are just within walking distance. Further more the very charming as well as romantic Plazuela Machado is just a 5 minutes walk away from the Oldtown Condo. Not to forget to mention which excellent feeling a walk on the most famous and most beautiful “Malecon”-walking path along the ocean which connects the old town to the Golden Zone will give you. Around Machado you will find a great variety of culture and art, as there is for instance the famous “Angela Peralta Theatre” as well as a row of museums or galleries and not to forget the wonderful Basilica Cathedral in the heart of Mazatlan. Further more the surroundings offer you lots of possibilities to enjoy your nights with fiestas. Of course there is the Golden Zone, which is a very beautiful place to be, but for those who want to enjoy the traditional Mexican culture, the Oldtown Condo is just the best choice. The condo is located on the second floor and is fully furnished. It has 1 bedroom with a king-size-bed, 1 bathroom and a kitchenette (microwaves, pots and pans, etc.). The condo has central air conditioning and beach access, so you can go for a swim or stay in your comfortable Condo on those hot days.